BOMEX 2018 in Calgary offered building owners and property managers from across Canada a guided tour of an innovative and shining example of how to turn an aging downtown property into an office building of the future. 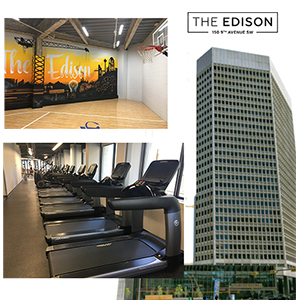 The Edison is a first of its kind in Calgary. Aspen Properties took a 30-storey B-class tower built in 1981 and turned it into an amenity-rich building in the heart of the city. The goal was to attract potential new tenants in a commercial real estate market struggling with an elevated vacancy rate in the neighbourhood of 25 per cent. Greg Guatto, president and chief executive officer of Aspen Properties, said the transformed building, which it acquired in 2015, can serve as a template of what’s possible in older downtown office properties. “We are thrilled with the outcome on the building versus what we envisioned. . . . We’re ahead of our leasing plan when we acquired it. We’re not achieving the rents that we thought we would because we had just started the downturn then and we didn’t know it would be so prolonged,” said Guatto. Guatto said net rent is in the low $20s per square foot. He said many other landlords have expressed interest in what Aspen did with The Edison. “We’ve done a lot of tours of our friends in the business for sure and other landlords are interested. We need to be an attractive place as a city for young people to come and work,” said Guatto. “Companies need to attract talent. I’ve heard words like ‘Aspen has started the amenity war in downtown. Everyone’s trying to do amenities now’. Aspen Properties bought the former Encana Place tower, across the street from the Fairmont Palliser Hotel, from energy giant Encana in 2015. Almost immediately, it began to redevelop the 450,000-square-foot building. When Calgary-based Aspen bought the tower, Guatto said the company liked the opportunity to reposition the asset. Repositioning assets and creating additional value are among its core philosophies. * Finally, there is access to bicycles for tenants to roam around the downtown streets. When Aspen bought the building there was one tenant (Brion Energy), a sub-tenant of Encana which occupied about half the building. Encana had a head lease on the building and was paying rent for a couple of years. “We knew that tenant was probably leaving at the end of that lease. Call it 100 per cent leased, but with a short fuse. Two years, and then we knew it would be vacant,” said Guatto. Today, the building is about 70 per cent leased. With two floors of co-working space, there are about 50 tenants currently in the building. The largest single tenant today is on one full floor of 15,000 square feet. The mix of tenants ranges from a relatively new engineering company to a family office to several young tech companies to an angel investment firm to a venture capital company. The co-working space houses a myriad of young companies in various industries. “We’ve had some larger tenants look at it for sure. We’re currently working on a 60,000-square-foot tenant and that will be a four-floor tenant. After we do that, I’m not sure we can accommodate too many big ones just because of the building filling up,” said Guatto. Aspen’s assets are valued at between $900 to $1 billion, comprised of office properties in downtown Calgary and Edmonton. It owns two office buildings in Edmonton and seven office buildings in Calgary, including the Calgary Tower. Guatto said while Calgary’s downtown office sector is still struggling, he believes the city’s energy businesses feel more stable today than they have in some time. However, he doesn’t see them leading a rapid recovery. Efforts to attract suburban office tenants into the downtown are also helping. “We’ve seen a couple of those, because they’re taking advantage of the opportunity to move up into the better buildings,” Guatto said. “I think we’re in a tough market for a while, but the better buildings will do well in that move-up market.